FitSW Personal Trainer Software has helped over 10,000 personal trainers grow their business and manage their clients' fitness all from their mobile device or computer. Build Custom Workouts, Plan Meals, Track Progress, and more! 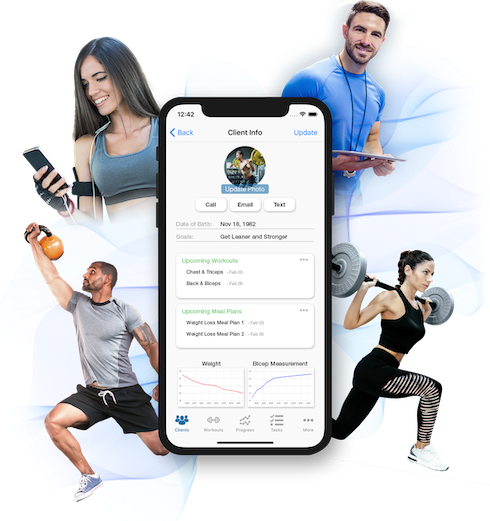 FitSW's web software and mobile apps provide personal trainers with a complete health and fitness management solution to keep their clients on-track and motivated! Easily create custom workouts tailored to your clients and track their workout results. Choose from nearly 1000 exercises organized by muscle group or add your own custom exercise. Every exercise has a demo video, so your clients will always know how to do a specific exercise. You and your clients can quickly log workout results and review past results from anywhere. Progress Graphs will keep your clients engaged, motivated, and on-track. Track any type of metric: Weight, Body Fat %, Waist Size, Bicep Size, Bench Press, and more! Data entry is very simple and automatically creates beautiful looking graphs. Share these progress graphs to Facebook or Twitter with one click. Easily create meal plans, record food intakes, and keep tabs on fitness clients with diet logs. Choose from thousands of foods or add your own. Food database includes all macronutrient data. Help clients track daily nutrition intake with FitSW's automatic calorie and macronutrient calculators. Clients can effortlessly build meal logs that can be easily reviewed and analyzed. FitSW enables you to message your clients directly in the app and on the website. This easy-to-use messaging ensures you can always keep in touch with your clients, increasing their motivation and engagement. Create easy to follow tasks and measurable goals for your clients to help them stay focused. FitSW automatically measures task adherence so you can monitor client success. FitSW has everything you need to manage and grow your personal training business. You have the health knowledge, fitness know-how and motivation skills - we give you the tools you need to easily and most effectively apply those to your clients and their goals. With multiple platforms, you and your clients can access FitSW anywhere. Access FitSW from our website on any device or use our iOS or Android apps. PC, Mac, iOS, Android all work seamlessly together. FitSW is the highest rated personal training software app for iOS devices, Android devices, and the web. Save time, Maximize your Clients' Success and Grow Your Business with FitSW!